The compact SUV hits a sweet spot for many car buyers. It’s big enough to haul adults and their gear in comfort, yet not too big. It’s small enough that navigating city streets presents no problems, and it doesn’t consume gas at a rate that makes fill-ups a painful experience. The problem is, most of these vehicles just aren’t a compelling alternative to a well-equipped luxury sedan. The 2018 Buick Envision is a notable exception. Slotting into the Buick SUV line-up between the smaller Encore and the huge Enclave, the Envision is a comfortable, upscale SUV that checks all the boxes. With an overall length of 4.67m, the Envision is 50 cm shorter than the three-row Enclave and 39 cm longer than the Encore. That creates ample space for seating up to five adults, especially in the back where a sliding rear seat provides almost limo-like legroom. Cargo-carrying capacity is equally impressive. Leave the back seats upright for 761 liters or fold them down to gain a total of 1,622 liters. And an almost flat load floor makes it easier to carry whatever it is you need. “Quietly refined” might be the best way of describing the Envision. The distinctive Buick “waterfall” grille stands out and yes, for traditionalists there are still portholes, (check the hood, not the fenders,) but the overall look is one of discrete elegance. Two folds run down the flanks, one between the wheels, the other linking the door handles to the taillights. The tailgate leans forward, helping create a sense of dynamism. 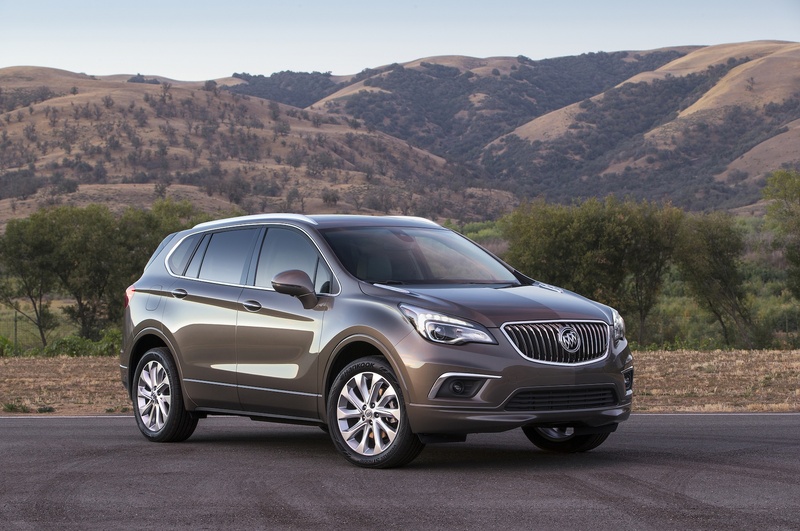 Overall, the Envision looks trim and athletic, a quarterback rather than a linebacker. For 2018, Buick is offering the Envision in four trims: Preferred, Essence, Premium I and Premium II. At all levels, the interior is both comfortable and luxurious, with high-quality materials and excellent build quality. Standard equipment includes heated front seats, an 8” touchscreen with Apple CarPlay and Android Auto compatibility, fog lamps and a power liftgate. Essence and Premium trims add blind spot warning along with leather upholstery and heated rear seats. Move to the Premium trims and the 18” alloy wheels are upgraded to 19’s. Inside, you’ll find a Bose audio system and Lane Keep Assist to make highway driving a little easier. All-wheel-drive is standard on the 2018 Buick Envision, as is a six-speed transmission, but there’s a choice of two engines. Preferred and Essence trims get a 2.5-liter motor making a respectable 197 hp and 192 lb-ft. The two Premium trims come with a 2.0-liter turbo that delivers 252 hp and 260 lb-ft of torque. Gas consumption figures for the bigger engine are 11.1 and 8.6 L/100 km City and Highway. The smaller unit earns ratings of 11.8 and 9.1 L/100 km respectively. Buicks have always been about providing a civilized and relaxing experience, and the Envision hews to that tradition. The new HiPer strut front suspension soaks up bumps and vibration from uneven roads yet minimizes any sense of roll or sway. The result is an exceptionally smooth ride that won’t leave your back aching and stomach churning. Is the 2018 Buick Envision for you? If you want an SUV that goes easy on the “utility”, yes. The Envision is as comfortable and well-equipped as any luxury car. If you want an SUV that will swallow vast quantities of cargo yet will still fit in regular parking bays, the Envision is definitely for you. And if you want an SUV that you’ll enjoy driving and that won’t punish you with a hard ride, this is the one you should try. Or to put it another way, the Envision will suit just about everyone. Young families, retired couples, people with dogs and people who just need to carry stuff should all take a look. The best way to find out about the 2018 Buick Envision is to see it for yourself—and of course we at Budds’ Chevrolet Cadillac Buick GMC will be very happy to show you the vehicle and demonstrate its features. Then you can decide if it hits your own car-buying sweet spot.